We have a number of guides that work for the Ely Fishing Guide Company. They are the best of the best! You feel like your in the right boat when you spend a day with our guides. Our guides have a combined total of over 40 years of actual professional guiding experience in the Ely area and the Boundary Waters Canoe Area Wilderness (BWCAW). Our guides fish as a team, this is a unique advantage for our customers. You not only get to experience the knowledge and skill of your guide, but all of the guides combined! We are able to keep our customers on fish by sharing information on fish locations. All of our guides are insured and licensed to operate in the BWCAW by the U.S. Forest Service. We set the standard for the most knowledgeable and professional guides in the area. Rob Nelson is the owner and founder of the Ely Fishing Guide Company LLC. 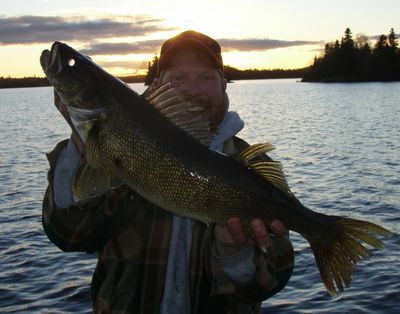 For over 20 years he has been a professional guide making his living guiding fishing trips in Ely, MN and the Boundary Waters Canoe Area Wilderness. He has a passion for fishing, especially in the Ely area. He is a year round full time guide. He guides fishing trips, guides Pheasant hunts in South Dakota and guides winter ice fishing trips as well. His best catch ever was his wife Ginny who he first met on Basswood Lake! Rob and his wife Ginny have two beautiful daughters Siiri and Sadie. He truly believes he has the best job in the world. People and fishing are two things you have to love in order to be a successful guide and well, he loves them both! He prides himself in the number of repeat customers, some have been coming for 20 years. In this business, that says it all!! You know you're in the right, qualified and experienced hands when fishing with Eli Hill. Eli has acquired his United States Coast Guard Captains license. He has been fishing in the BWCAW area his whole life. Fishing is his life and he does it well. When you fish with Him, you will have plenty of laughs as well as fish in your boat. During the school year He spends his time as an Industrial Tech teacher. This allows him time for his true passion in the summer months, fishing. Eli has been a professional guide in Ely, MN and the BWCAW for 20 years. He spends every chance he gets in the pursuit of fish. Mike Stark has been a guide for the Ely Fishing Guide Company in the Ely, MN and the BWCAW Since 2007. He is a very skilled fisherman as well as a very qualified guide. His patience and knowledge of fishing is unsurpassed among his pears. He is very laid back and will make safe and comfortable decisions that will allow you to maximize your catch and enjoy your day. He will provide you with expert and skilled techniques and strategy to allow you to catch the fish of your dreams. Mike has extensive guide training in his previous job at the Outward Bound base here in Ely, MN. Mike guides canoe and sled dog trips in the BWCAW and is a certified Wilderness First Responder. He is now a professional full time year round fishing guide. In the summer, Mike's real passion, is putting customers on big walleyes. Cory is a lifelong resident of Minnesota and he has lived in the Ely area for over a decade. His true passion is for the outdoors, especially when it comes to fishing! He is a very talented fisherman and he can target any species, but his true love is the walleye. Over the years he has built up a solid knowledge base of tips and tricks to put fish in the boat. Cory has previously worked eight seasons with the US Forest Service where he spent a lot of his time in the BWCAW. When he is not hunting or fishing you can find him working on his homestead which includes a timber frame garage and a cord wood house that he built. Nothing makes Cory happier than being out on the water fishing and sharing that passion with others.